Inflammatory Myofibroblastic Tumour (IMT) is a rare spindle tumour that mimics malignant processes. It can affect any part of the body, but rarely occurs in the genitourinary tract. 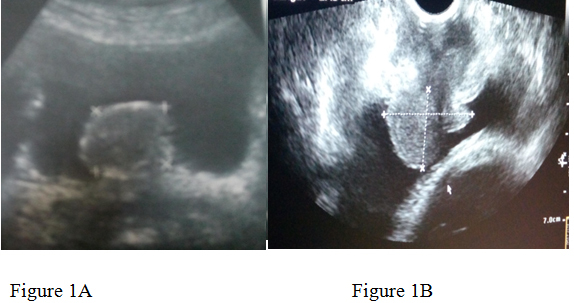 We report a case of urethral IMT in a 31-year-old pregnant female of 18 weeks gestational age. The diagnosis was established by histopathological findings. This is the first document case in the world, as no such documentation has been made in a pregnant female. Inflammatory Myofibroblastic Tumour (IMT) is a rare entity of vague etiology and pathogenesis . It appears to be a benign process mimicking malignant processes. IMT can affect any part of the body, but is common in the lung and orbit . It rarely occurs in the genitourinary tract, in which the bladder is its most common site . We report a case of urethral IMT in a 31-year-old pregnant female of 18 weeks gestational age. A 31-year-old pregnant woman of 18weeks gestational age presented to our hospital. Her complaints of increased frequency of urination, obstructive urinary symptoms of 10days duration. She has 1 male child. Her medical history was clear and she was not a smoker. Physical examination of the external genitalia was done in the lithotomy position, which does not reveal a mass at the external urethral meatus. Ultrasonography of the KUB region performed which revealed a polypoidal mass of size 3.8*2.5 cm originating near to the bladder neck. Confirmation done by MRI of pelvis. The mass was planned to be excised after explaining associated risks regarding outcomes of pregnancy. Thereafter, cystoscopy was performed which showed a mass originating from the proximal urethra and projecting into bladder. Near total resection of the tumour was done and the mass was subjected to histopathology. Histopathological findings showed fascicules of spindle cells proliferation consisting of fibroblastic and myofibroblastic cells accompanied by a prominent infiltration of lymphocytes and plasma cells. Post operatively there were no maternal and fetal complications .The patient’s symptoms improved and the fetus is doing well at 7 weeks follow-up. Inflammatory Myofibroblastic Tumour is a rare spindle tumour which mimics malignant lesions . Because of its histological heterogeneity, it has received many names over the past years, including plasma cell pseudotumor, inflammatory pseudotumor, xanthomatous pseudotumor, pseudosarcomatous myofibroblastic proliferation, inflammatory myofibrohistiocytic proliferation, atypical fibromyxoid tumor and atypical myofibroblastic tumour [3-5]. It is not clear whether IMT is benign, malignant or part of a spectrum of benign to malignant spindled soft tissue tumours. The World Health Organization continues to classify myofibroblastic tumour as a distinct borderline lesion with uncertainty as to whether it is reactive or neoplastic in nature. Since IMT was first reported by Symmers on 1921, IMT has been found at various organs . Although the lung was the best known and most common site, it has subsequently been recognized involving a wide variety of anatomic sites. In the genitourinary tract IMT has been reported in the kidney, urethra, prostate, ureter and rete testis but is most frequently observed in the bladder. While pulmonary IMT occurs more commonly in mid-adulthood, extrapulmonay IMT occurs more often in the soft tissues and viscera for children and young adults . Occurring during the inflammatory process. So although definite radiologic differentiation from malignancy is not clearly possible, manifestations of inflammatory pseudotumor and also imaging-guided biopsy can help avoid unnecessary radical surgery . 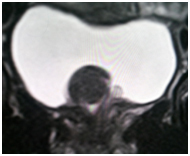 However, due to the specific location of urethral IMT, it seems that radiology cannot be very helpful in its diagnosis. Patients may present with fever, weight loss, growth retardation, thrombocytosis, iron deficiency anemia, hypergammaglobulinemia, symptoms related to mass effect, or a combination of these signs and symptoms . The differential diagnosis of IMT includes both benign and malignant lesions. Leiomyoma is a benign lesion which stains positively for vimentin, smooth muscle actin and desmin, similar to IMT. Also leiomyosarcoma, sarcomatoid carcinoma and rhabdomyosarcoma are malignant lesions which can be categorized in the differential diagnosis of IMT. The microscopic features of the IMT are a myxoid, spindle cell dominant and less compact appearance . In all of the lesions, the mixed inflammatory infiltration was a distinctive microscopic feature. The spindle cells were reactive with antibodies to vimentin, smooth muscle actin, and muscle-specific action in a majority of cases . Three basic histological patterns are recognized, which are myxoid/vascular, compact spindle cells, and hypocellular fibrous patterns . The three patterns might be equally represented with one blending into another, or one or two patterns might predominate. And none of which had any discernible relationship to prognosis. Typical IMTs can be locally aggressive, sometimes requiring radical surgical resection. Metastasis is not seen in typical cases with only a rare incidence of malignant transformation and remote metastasis . While reviewing the literature, only 3 cases of IMT of the urethra in a female patient have been documented. No documentation of IMT in a pregnant female urethra has been made yet. Although rare, IMT should be considered in the differential diagnosis of urethral masses in female patients. Also, both the surgeon and patient should be aware of its probable risk of malignant transformation and recurrence; therefore follow-up is warranted. ©2015 AjayK. This is an open-access article distributed under the terms of the Creative Commons Attribution License, which permits unrestricted use, distribution, and reproduction in any medium, provided the original author and source are credited. Figure 1. A) Trans-Abdominal USG showing a polypoid mass of size 3.8*2.5 cms in the bladder. B) Trans-Vaginal USG showing similar findings. Figure 2. MR Pelvis showing 3.8*2.5cms tumor originating from the neck of bladder. Figure 3. A) Intra-operative cystoscopy images showing tumor arising from the proximal urethra and extending into bladder. B) Resection of the tumor. C) Post resection image in the proximal urethra.